02 U.S., JOVIALISTE & NOSTRADAMUS: THE WORD. I SUPPOSE THE WORD "JOVIALISTE" MEANS "UNITED STATES" FOR REFER TO ORIGIN OF THE SETTLEMENT OF AMERICA AND THE DAY OF THANKSGIVING (the people of thursday). LORD´S DAY? SO, WHAT IS THE DAY OF GOD? + For most Christians, Sunday is observed as a day for worship of God and rest, due to the belief that it is Lord's Day, the day of Christ's resurrection. In ancient Rome to this day was called dies solis (day of sun). + For both Jews and the Seventh-day Adventist, the seventh day of the week, known as Shabbat (or Sabbath for SDA), stretches from sundown Friday to sundown Saturday and is the day of rest. Roman Catholic and Eastern Orthodox churches distinguish between Saturday (Sabbath) and the Lord's Day (Sunday). Quakers traditionally refer to Saturday as "Seventh Day", eschewing the "pagan" origin of the name. Sabbatum Bible comes from the Latin, the Greek σάββατον (sabbaton), the Hebrew יום השבת (Sabbath), 'rest', 'rest day', derived from the verb Shabath 'cease', 'rest', 'save the Saturday ', and east of the Akkadian šabattum, rest. Its Latin name dies Saturni ("Saturn's Day") entered into Old English as Saeternesdaeg. Saturday was named no later than the 2nd century for the planet Saturn, which controlled the first hour of that day according to Vettius Valens. The name Friday comes from the Old English Frīġedæġ, meaning the "day of Frige", a result of an old convention equivocating the Old English goddess Frige with the Roman goddess Venus (the goddess of beauty and love in Roman mythology) , with whom the day is associated in many different cultures. In French "Vendredi" (Friday) comes from the Latin dies Veneris, "day of Venus'. + Thursday is the fourth day of the week. The name "Thursday" comes from the Latin Jovis dies, or "day of Jupiter '. And then WHO gives thanks to God on Thursday, the day of Jupiter? 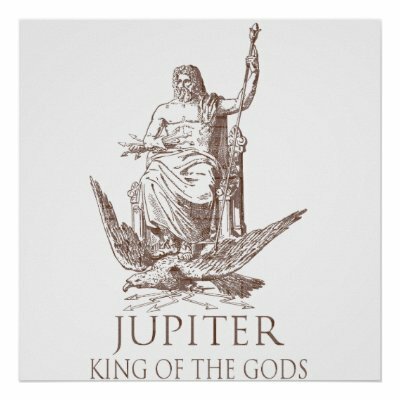 Jupiter (Latin Iuppiter), also called Jove (Iovis), is the chief god of Roman mythology, the father of gods and men (pater et deorum hominum). + Thanksgiving Day in the United States is a holiday on the fourth Thursday of November. George Washington, the first president of the United States, proclaimed the first national Thanksgiving Day in 1789. + Thanksgiving Day has been an annual holiday in the United States since 1863. Not everyone sees Thanksgiving Day as a cause for celebration. Each year since 1970, a group of Native Americans and their supporters have staged a protest for a National Day of Mourning at Plymouth Rock in Plymouth, Massachusetts on Thanksgiving Day. American Indian Heritage Day is also observed at this time of the year. + The dates of Thanksgiving in the era of the Founding Fathers until the time of Lincoln had been decided by each state on various dates. The first Thanksgiving celebrated on the same date by all states was in 1863 by presidential proclamation. The final Thursday in November had become the customary date of Thanksgiving in most U.S. states by the beginning of the 19th century. And so, in an effort by President Abraham Lincoln (influenced by the campaigning of author Sarah Josepha Hale who wrote letters to politicians for around 40 years trying to make it an official holiday), to foster a sense of American unity between the Northern and Southern states, proclaimed the date to be the final Thursday in November. + It was not until December 26, 1941, that the unified date changed to the fourth Thursday (and not always final) in November—this time by federal legislation. President Franklin D. Roosevelt, after two years earlier offering his own proclamation to move the date earlier, with the reason of giving the country an economic boost, agreed to sign a bill into law with Congress, making Thanksgiving a national holiday on the fourth Thursday in November. This is what Nostradamus wrote about the "Jovialiste"
Nostradamus refers repeatedly to "Jeudy people" who, after studying the quatrains, seems to be closer to the "Jovialistes" and jovial people. "Et ne seront du tout leurs assaillemens vains, & au lieu que iadis fut l'habitation d'Abraham, sera assaillie par personnes qui auront en veneration les Iouialistes." "And will any of their assaillemens vain, and instead that formerly was the room (1) of Abraham (where Abraham was born) will be assaulted by persons who have in the veneration Iouialistes.. "
+ (1) Room or Habitation, origin:late 14c., "act or fact of dwelling;" also "place of lodging, abode," from O.Fr. habitacion, abitacion "act of dwelling" (12c.) or directly from L. habitationem (nom. habitatio) "act of dwelling," noun of action from pp. stem of habitare (see habitat). + Habitat:1762, as a technical term in Latin texts on English flora and fauna, lit. "it inhabits," third person singular present indicative of habitare "to live, dwell," frequentative of habere "to have, to hold, possess" (see habit). General sense of "dwelling place" is first attested 1854. + According to the Bible, Abraham must have been born in Ur of the Chaldees. Believed to have been at the mouth of the Euphrates, according to some authors. He died and was buried in Hebron with his wife and the rest of his family (Sarah, Isaac, Jacob, Rebecca and Leah). + The remains of Ur ruins form a hill 12 meters above sea level in the middle of the desert of Iraq, about 24 km southwest of Nasiriyah. The ruins were called by local people al-Muqayyar Tell (mound of pitch). + So if "Jovialiste" means United States and "Ur" means Iraq, Nostradamus is speaking of the North American-led alliance to invade Iraq. .....and more one time. Century I - Quatrain 50. Old French. Par terre & mer aux Orients tempeste. By land and sea tempest to Easts. Do you can remember what three seas or oceans surrounding America? Century VII - Quatrain 71. Old French. Century VII - Quatrain 71. Possible English traslation. From the four parts will come to honor. Do you guys remember what was called the Cold War? what did United States at that time helping their allies? "Great water or sea" ... Do you remember the NATO (North Atlantic Treaty Organization)? Century VII - Quatrain 73. Old French. Century VII - Quatrain 73. Possible English traslation. And unfair the clergy jurist. Do you remember that group of lawyers refused to comply with requests from the United States? And where and when? Possible solution: The Taliban Clerics´ statement on Bin Laden. Almanach 1566 - presage CXXIX (novembre). Old French. Iouiaux unis en route toute secte affolée. Almanac 1566 - presage CXXIX (november). Possible English traslation. Jovials united in the escape, all sects distraught . 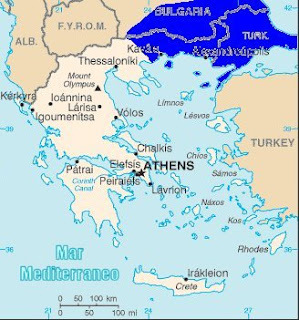 + This is evident, Thrace is part of Greece. 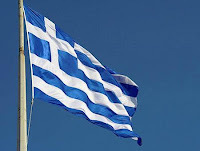 Nostradamus tells the story of a military defeat in Greece and the flight of the alliance members "Jovialiste" or NATO. Turkey will return to being the owner of Greece (and perhaps of the Balkans). + Thrace (in Greek Θράκη, Thraki, Turkish: Trakya, Bulgarian: Тракия, Trakija) is a region of southeastern Europe in the Balkan peninsula, the northern Aegean Sea, located in Bulgaria, Greece and European Turkey. + Look at the map. +But the ancient Greeks employed the term "Thrace" to refer to all of the territory which lay north of Thessaly inhabited by the Thracians, a region which "had no definite boundaries" and to which other regions (like Macedonia and even Scythia) were added. + Greece's fate depends on victory in the U.S. and its allies, but so Greece will return to being Turkish territory. Almanach 1560 - presage LII (julliet). Old French. Longue crinite leser le Gouuerneur. Almanac 1560 - presage LII (july). Possible English traslation. - I would argue that "Jovialistes" and its allies will be greatly affected by the impact of a comet, so weak so-called BE "Razes" taken advantage of it. - The "Razes" appear in other quatrains of Nostradamus. 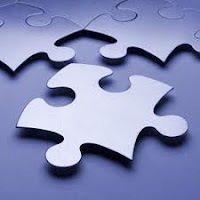 This is a puzzle,is another puzzle that soon I will show. - Who will be the "razes" or shaved? Tonsure is the traditional practice of Christian churches of cutting or shaving the hair from the scalp (while leaving some parts uncut) of clerics, monastics, and, in the Eastern Orthodox Church, all baptized members. Tonsure, usually qualified by the name of the religion concerned, is now sometimes used more generally for such cutting or shaving for monks, devotees, or mystics of other religions as a symbol of their renunciation of worldly fashion and esteem, e.g., by Buddhist novices and monks, and some Hindu streams. A Hindu boy's hair tonsured with a sikha reminder during Upanayana (sacred thread ceremony).Wikipedia. Opponents of the tonsure should not miss her in the ministers of the Church, when the idolaters used it. The Egyptian priests cut their hair, the Assyrians offered to their false gods, which also accustomed the Romans in his first shave. 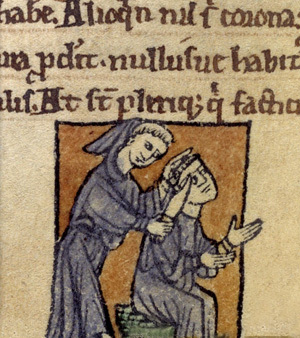 The abancios were cut only the hair on the back of the head, and on the contrary, the machios and anasios, whose figure was not far from the semicircular used Simon Magus, according to Bede, who noted noticed this practice in some Scots; finally, the Prophet Habakkuk testifies the tonsure of the priests of Babylon, but as God forbid the Jews gentils rites, in this sense be understood sacred texts alleged by heretics against the ecclesiastical tonsure. Islam: It is customary (but not required) for men who complete the hajj to shave their heads as a reminder that they have been washed clean of all prior sins. Women (and some men) cut only a lock of hair rather than shaving the entire head. The word tonsure is used less often to describe these Islamic practices. *Similar: hairless (having no hair or fur), like Skin-heads. Remember 1: Ayatollah Ruhollah Khomeini, was the most popular ayatollah, who was actually nstrumental in spreading the importance of the word ayatollah during the 1979 Iranian revolution. The ayatollah is a high ranking religious authority for the Shiite branch of Islam. He is highly revered and respected as the most learned man of the community. The word ayatollah means "man of God." His decisions are to be accepted as binding by his followers and the Shiite community. The person who carries the title of ayatollah is deemed to be a specialist in Islamic studies, philosophy, ethics and jurisprudence. Remember 2: Al Qaeda is also a religious organization, they are not like the Iranian Shia but religion is its reason for being. 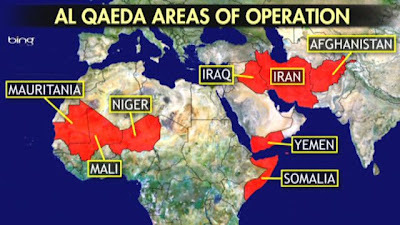 "The Base" and alternatively spelled al-Qaida and sometimes al-Qa'ida) is a global militant Islamist organization founded by Osama bin Laden at some point between August 1988 and late 1989, with its origins being traceable to the Soviet War in Afghanistan. 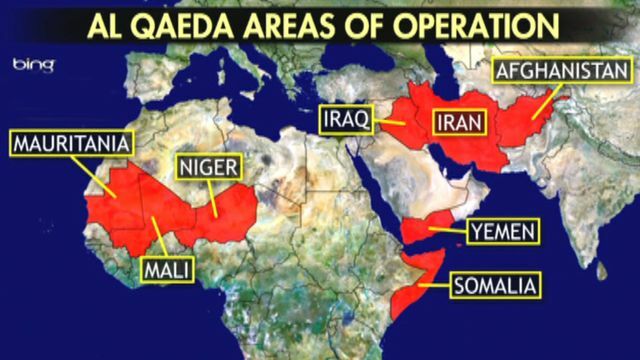 It operates as a network comprising both a multinational, stateless army and a radical Sunni Muslim movement calling for global Jihad and a strict interpretation of sharia law. It has been designated as a terrorist organization by the United Nations Security Council, NATO, the European Union, the United Kingdom, the United States, and various other countries (see below). Al-Qaeda has carried out several attacks on Christian churches, and other targets it considers kafir. "The votes still aren't fully counted in Egypt, but the Obama administration has seen enough to reverse long-standing and well-rooted policies to shun the theocratic, global Caliphate-minded Muslim Brotherhood, whose philosophy spawned terrorist movements from Hamas to al-Qaida." + More in the link mentioned previously. En terre ferme Oliuier plantera. - Jupiter is United States and Venus is Muslims for their holy day (Friday is the day , in Roman mythology, of the goddess Venus). Sol is Power and Mercury ( In Roman mythology Mercury is the god of commerce,travel and thievery. Also known is Mercury as Hermes, the messenger of the Gods in Greek mythology). + My opinion is that Nostradamus wanted to say that Muslims came to power that the U.S. will lose (in his absence, by robbery or a bad deal). There will be a war and France create a new military alliance and will get a total victory, and long-term peace (the olive tree planted firmly in the ground). 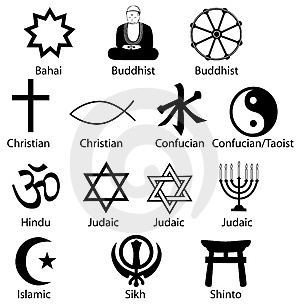 - Venus is the goddess of love and Mars is the god of war, Neptune is the god of the sea and the moon represent Muslims; and Jupiter is U.S.A.
- I guess that means when U.S. bet for peace and love (Obama Nobel Peace Prize) , Muslims reach their maximum power, U.S. military fleet will be destroyed by war. Century Dictionary and Cyclopedia: n. A person of jovial character or disposition. GNU Webster's 1913: n. One who lives a jovial life. 1620s, from Fr. jovialite, from jovial (see jovial). 1580s, "under the influence of the planet Jupiter," from M.Fr. jovial (16c. ), from It. joviale, lit. "pertaining to Jupiter," and directly from L. Iovialis "of Jupiter," from Iovius (used as gen. of Iuppiter) "Jupiter," Roman god of the sky (see Jove). The meaning "good-humored, merry," is from astrological belief that those born under the sign of the planet Jupiter are of such dispositions. Related: Jovially. Roman god of the bright sky, late 14c., from L. Iovis, from PIE *dyeu- "to shine," with derivatives referring to the sky, heavens, a god (see diurnal, and cf. Zeus). In classical Latin, the compound Iuppiter replaced Old L. Iovis as the god's name. Supreme god of the ancient Greeks, 1706, from Gk., from PIE *dewos- "god" (cf. L. deus "god," O. Pers. daiva- "demon, evil god," O.C.S. deivai, Skt. deva-), from root *dyeu- "to gleam, to shine;" also the root of words for "sky" and "day" (see diurnal). The god-sense is originally "shining," but "whether as originally sun-god or as lightener" is not now clear. Late 14c., from L.L. diurnalis "daily," from L. dies "day" + -urnus, an adjectival suffix denoting time (cf. hibernus "wintery"). Dies "day" is from PIE root *dyeu- (cf. Skt. diva "by day," Welsh diw, Bret. deiz "day;" Arm. tiw; Lith. diena; O.C.S. dini, Pol. dzień, Rus. den), lit. "to shine" (cf. Gk. delos "clear;" L. deus, Skt. deva "god," lit. "shining one;" Avestan dava- "spirit, demon;" Lith. devas, O.N. tivar "gods;" O.E. Tig, gen. Tiwes, see Tuesday). O.E. Þurresdæg, perhaps a contraction (influenced by O.N. Þorsdagr) of Þunresdæg, lit. "Thor's day," from Þunre, gen. of Þunor "Thor" (see Thor); from P.Gmc. *thonaras daga- (cf. O.Fris. thunresdei, M.Du. donresdach, Du. donderdag, O.H.G. Donares tag, Ger. Donnerstag "Thursday"), a loan-translation of L. Jovis dies "day of Jupiter," identified with the Gmc. Thor (cf. It. giovedi, O.Fr. juesdi, Fr. jeudi, Sp. jueves), itself a loan-translation of Gk. dios hemera "the day of Zeus." + In Nostradamus’s prophecies about popes, he frequently comments on the fore-coming destruction of moral and spiritual values, both inside and outside the Christian Church. Some of Nostradamus’s Quatrains mention strange happenings in the hierarchy of the Vatican, and this one makes reference to a particular body of people who plot to kill a pope. Pope John Paul I died only 33 days into his Pontificate (August 26, 1978 - September 28, 1978). It was one of the shortest reigns in the annals of the papacy. The official cause of death was myocardial infarction (a heart attack). But there was a great deal of confusion in the details of his sudden death, and many were crying - murder! Crainte estainte la nuit de sa mort guide. To keep prisoner his blood in the sacred chalice. + As the world now knows, John Paul I died under suspicious circumstances (see links). The first quatrain could refer to the shy and pleasant Pope John Paul I, but the second quatrain is more difficult to interpret: On the one hand an important tomb is uncovered and the other blood, perhaps violently shed, will be hidden. "This smile was not a mask, behind which a person can hide himself nor was it a studied gesture to obtain something, but the expression, unconscious and natural of a soul transparent and luminous to its very depths. Yes it is not a question of a gift received from nature, but rather something acquired from Jesus Christ, living at an ever deeper level". Pope Benedict XVI is also on record as commenting that he considered Albino Luciani to be a saint and prayed every day for his canonisation. His cause has been opened and is proceeding. One of the world-wide Ambassadorial tributes to the late Pope spoke of his ‘candour’. Certainly it took enormous courage to liken human development to the proper maintenance of a car whereby we would not put in champagne when told it needed petrol or jam for oil!! The point is clearly made that best ways to look after our God-given bodies are self-evident. On another occasion whilst making a comparison between illness and health he urged us to ‘inject each other with love’ to combat the violence of society. For a modern day Pope to risk such home-spun teaching was exceptional. John Paul II wrote of him that his ‘zeal and gifts as a catechist amazed us all…’He gave an example of catechesis at once popular and concentrated on the essential, one made up of simple words and actions that were able to touch the heart.’ (Catechesis Tradendae, 6). + In what tomb we talking about? Was the tomb of an apostle like Peter or Paul? + A great deal of confusion surrounds his death and, as a result, numerous conspiracy theories have grown up around the possibility that he was murdered, either because he was getting too close to some scandal or because conservative feared his progressive inclinations. Whether true or not, the Vatican has itself partly to blame because of its bungling of the matter. + In the first place, the Vatican lied about who found the body of John Paul I - originally, the Vatican claimed that he was discovered by his Irish priest-secretary, which was false. In fact, he was discovered by his housekeeper, Sister Vincenza. Secondly, the Vatican claimed that the last thing he was reading was The Imitation of Christ by Thomas á Kempis. This, too, was false and was only told for its public relations benefit. + Shortly after Pope John Paul I’s funeral, a rumour swept Vatican City that his body had been surreptitiously removed from the coffin and cremated. If so, this would indicate a premeditated action to destroy all evidence of poisoning in case anybody demanded that the Pope’s body be exhumed for scientific tests. + But still, there were no indictments, no subpoenas issued, no trials, no convictions made. 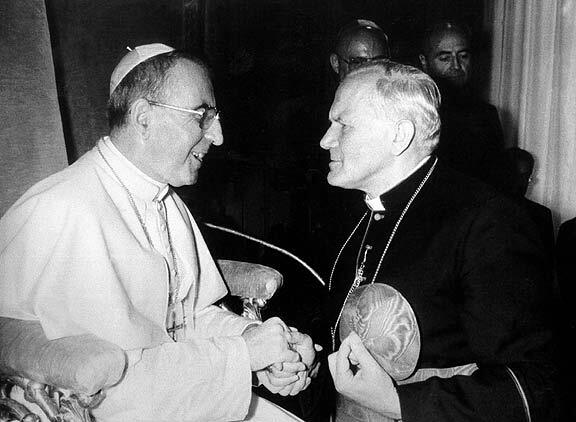 It has been 34 years since the death of Pope John Paul I and the mystery will continue to be debated. The most probable truth is that John Paul I was suffering from serious health problems which he failed to seek treatment for. As a result, the most likely lesson of his death is not the corruption of religious institutions, but rather the more prosaic fact that people should watch their health better perhaps a more important lesson, but not nearly exciting enough for conspiracy theories ...... but ......Who knows? 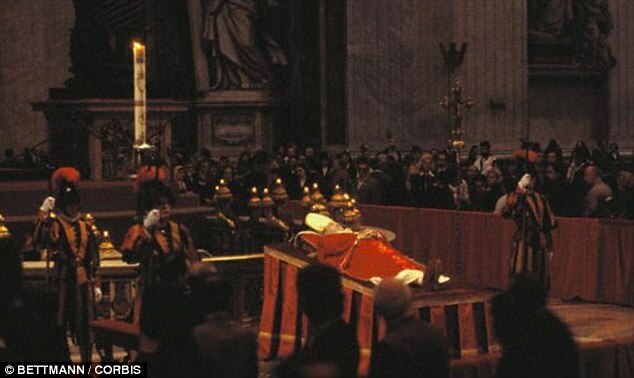 Pope John Paul I's body lies in state in St Peter's Basilica, 1978. The behaviour of the authorities made a striking contrast to the way that the deaths of his predecessors had been handled for a century and more. "To keep prisoner his blood in the sacred chalice." 03_ KILL THE POPE: THIS IS THE END & ST MALACHY. THE LAST FOUR POPES: 109, 110, 111 & 112. + The Prophecy of the Popes, attributed to Saint Malachy, is a list of 112 short phrases in Latin. They purport to describe each of the Roman Catholic popes (along with a few anti-popes), beginning with Pope Celestine II (elected in 1143) and concluding with the successor of current pope Benedict XVI, a pope described in the prophecy as "Peter the Roman". + It is notable that where the interpretation of the prophecy is clear (as is the case for almost all of the Popes prior to 1590), the reference is almost always to some characteristic possessed by the Pope prior to assuming the Papacy—e.g., his birthplace, his arms, his surname, or his cardinal see. However, for more recent Popes, efforts to connect the prophecy with the pope have often focused on the events of his pontificate.This difference suggests that until 1590 the sentences were falsified, the author already knew the facts, but supporters, such as author John Hogue, who wrote a popular book titled The Last Pope about the claims, generally argue that, even if the author of the prophecies is uncertain, the predictions are still valid. We won’t know the validity of these predictions until time has passed. + The prophecy was first published in 1595 by Arnold de Wyon, a Benedictine historian, as part of his book Lignum Vitæ. Wyon attributed the list to Saint Malachy, the 12th‑century bishop of Armagh in Ireland. According to the traditional account, in 1139, Malachy was summoned to Rome by Pope Innocent II. While in Rome, Malachy purportedly experienced a vision of future popes, which he recorded as a sequence of cryptic phrases. This manuscript was then deposited in the Roman Archive, and thereafter forgotten about until its rediscovery in 1590. -Pontiff for 33 days, 1978. + Albino Luciani, born in Canale d'Agardo, diocese of Belluno, (beautiful moon) Elected pope on August 26, his reign lasted about a month, from half a moon to the next half... before he died suddenly and mysteriously. + "Of the half moon" is a very accurate description regarding his beginning and also his short pontificate: After a life dedicated to the Church as a priest, he was elected Pope during the second day of the Conclave in August 26, 1978. 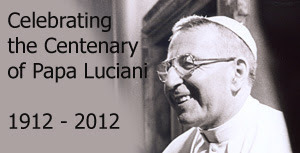 He died of cardiac attack in September 28 1978, thirty three days after the beginning of his papacy. + Even his name Albino Luciani means "White Light". + We from the land can only see half the moon. 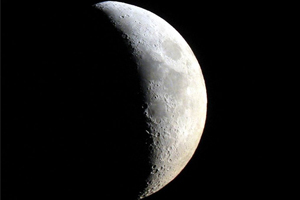 Only astronauts and spacecraft have observed his half hidden, for our eyes, of the moon. The people of Earth can see the reflection of sunlight on the surface of the moon, a white light by minerals of our satellite. + The name of the Pope is the sum of two names or two styles of "To be Pope": John Paul I was the first ever pope to assume a double name on election as supreme pontiff. He assumed the name 'John Paul' in honour of his immediate predecessors, John XXIII (liberal style) and Paul VI (conservative style) . 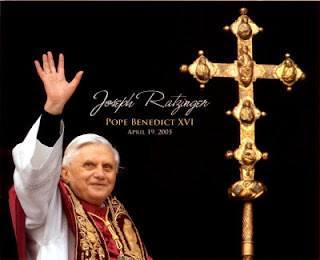 All previous popes had, on election, either kept their birthname or assumed a single name. 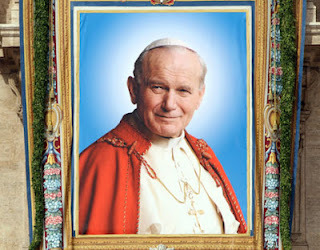 His successor, John Paul II, assumed his papal name out of respect for John Paul I. One Pope divided into two halves. + His pontificate has some bright and pleasant, and a dark and hidden. On the one hand John Paul I had an infectious smile and a cheerful disposition. Even in formal settings he was often photographed with a smile on his face. He brought a certain informality to the papacy, refusing to be carried on public occasions, as had his predecessors, on the shoulders of servants..... and on the other side there were many conspiracy theories surrounding the death of Pope John Paul I, all claiming that he had been murdered. Those implicated in these theories included the Mafia, the KGB, the CIA, Nazis, and even a secret group of masonic cardinals. The official cause of death was myocardial infarction, a type of heart attack. 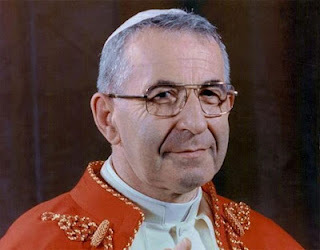 The Vatican did not help to alleviate the conspiracy theories, as they allowed John Paul I's body to be embalmed within a day of his death without a detailed autopsy. Possible explanation of the Latin text. + What does the Sun? The sun rises in the east and sets in the west, he illuminates and warms the world wiping out the cold and darkness. John Paul II was born in a country in Eastern Europe (Poland) and destiny took him west to Rome, and from there traveled the world spreading the word of God. + This description fits John Paul II perfectly, since he emerged as a especial light for the Catholic Church, promoting the faith from all angles. The works of John Paul II were truly the work of God, the labor of the sun. + John Paul II was a great traveler Pope, proclaimer of the gospel in more than 130 countries throughout the world, author of many apostolic letters, encyclicals and books. Canonizer of more saints in his pontificate than any other Pope in all history. During his last years as Pope he concluded his pontificate proclaiming the Holy Trinity, the Virgin Mary and the Eucharist. 111- Glory of the olive. + Chose the name Benedict after St. Benedict who started the Benedictine order whose Crest is an Olive Branch. 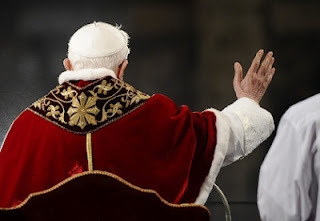 + Since he is said to have remarked in the Conclave after saying he would take the name Benedict that it was partly to honour Benedict XV, a pope of peace and reconciliation, perhaps Benedict XVI will be a peacemaker in the Church or in the World, and thus carry the olive branch. + The next pope could be a great peace maker. + Still not over his reign so theoretically the explanation of the Latin phrase this in some horrible future event: A great war like the one that explains the Latin phrase of Pope Benedict XV*: 104 Religio depopulata / 104 Depopulated religion. *Benedict XV reigned during, but had no influence to stop, the First World War. This unprecedented period of violence was mainly fought between the Christian powers of europe, destroyed empires which had lasted centuries and began the worldwide spread of atheistic Communism. + So his work would bring peace to a world at war. 112- In persecutione extrema S.R.E. sedebit Petrus Romanus, qui pascet oves in multis tribulationibus: quibus transactis civitas septicollis diruetur, & Judex tremêdus judicabit populum suum. Finis. 112- In extreme persecution, the seat of the Holy Roman Church will be occupied by Peter the Roman, who will feed the sheep through many tribulations, at the term of which the city of seven hills will be destroyed, and the formidable Judge will judge his people. The End. + For some religious war or religious persecution, the pope was obliged to do their work outside of Rome (Italy). Rome will be held by horde of evil or any foreigner army and governed by someone very evil. The city will be destroyed and that's the list of popes. + "Gloria Olivae" begins his reign as a pope bearing the “olive” branch of peace, but later he becomes the pontiff enduring Christ’s apocalyptic prophecies . In other words, his reign marks the beginning of apocalyptic wars and rumors of apocalyptic wars spreading out from the Holy Land across the whole world. + John Hogue said that: Taking Nostradamus’ final line in mind, the next pope, in the name of peace reaches out to radical Islam. Unfortunately, the enemy turns on him, and the great plague foreseen comes out of biological or chemical weapons of mass destruction used by terrorists. A number of Nostradamus’ prophecies infer such attacks on Rome will take place, forcing the evacuation of a future pontiff. + Will this be the end of the ancient city of Rome? + I suppose "Castor & Pollux in ship" means John Paul I and John Paul II will lead the ship of the Catholic Church. "Castor & Pollux in Ship". Two fishermen like St. Peter. "You are Peter, and upon this rock I will build my Church, and the power of death shall not prevail against it. I will give you the keys of the kingdom of heaven. Whatever you bind on earth shall be bound in heaven, and whatever you loose on earth shall be loosed in heaven "(Matthew 16:18-19). Maybe the fisherman's boat is lost but anyone can find what has been lost.